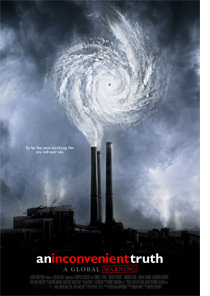 The Marketing of "An Inconvenient Truth"
Online Pledge – The main call to action for the movie site is not to view the trailer, but a pledge to see the film on opening weekend. This is smart for a number of reasons, not only because it solicits a very real promise from people to support the film, but because it underscores the importance of having a good opening weekend for the film as a way of gaining traction and credibility and generating positive word of mouth that can carry through to increasing the film’s longevity in theaters. 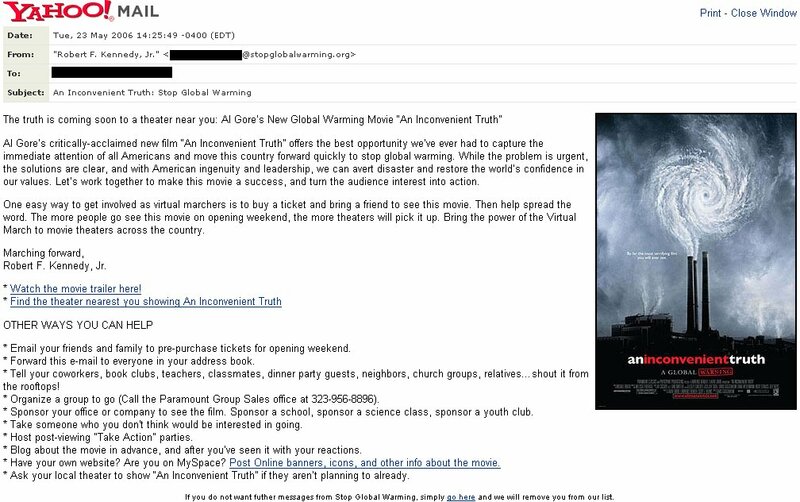 Partner Email Outreach – Before details of the film came out, I was aware of the www.stopglobalwarming.org eAdvocacy site and it’s concept of a virtual march. It seems that some of the same people behind that effort are helping on the marketing of this film, as the concept of pledging to see the film and soliciting an online community of supporters is very similar. A technique I particularly liked was their grassroots email campaign (see the email here) which encouraged those who were part of the stopglobalwarming.org community to make a strong effort to not only see the film, but to tell others about it, buy a ticket for someone unlikely to go otherwise, or do one of a list of other smart things to help spread the word about the film. 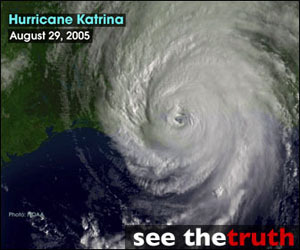 High Impact Online Advertising – The site is also supported by an advertising buy online, but rather than focus their efforts on large portal sites – the film is marketing through banners placed on Technorati and keyword marketing through the Google network that drives people to www.climatecrisis.net. While they may have significant other online advertising that I have not come across, the fact that they seem to focus on searches and Technorati works well because they can inform people seeking relevant information online through search, and increase the potential to get blogger buzz about the film by building awareness among bloggers through Technorati. Personal and Custom Content – As part of marketing for the film, there are some particularly engaging ideas such as the exclusive video clip on iFilm from the "green carpet" premiere of the film with Al Gore and tagged photos posted on Flickr, coupled with a range of downloads available on the site, from trailers to ecards, desktops, screensavers, and IM Buddy icons. The only criticism I could offer in this area was the notable absence of any downloadable content for mobile phones, a seemingly natural fit for marketing the film – particularly given the focus of other movie marketers on this channel. Email Reminders – A relatively simple idea, the site also offers the ability to request an email reminder to go and see the film on opening weekend. Again, this could have been made stronger by offering text message reminders as well, but I still like the idea of engaging the original pledge and following up with a reminder to get people to follow through on what they say they will do. Ultimately, I think the campaign to market the film presents an interesting case study for any marketers of a socially charged documentary or other social marketers to pay attention to. Aside from a few small criticisms of the lack of mobile marketing techniques or the mystifying choice of barely legible light gray for HTML text on the site – the smarts of this movie marketing strategy should do well to drive people to the theater to see this film. I’ve made my pledge.